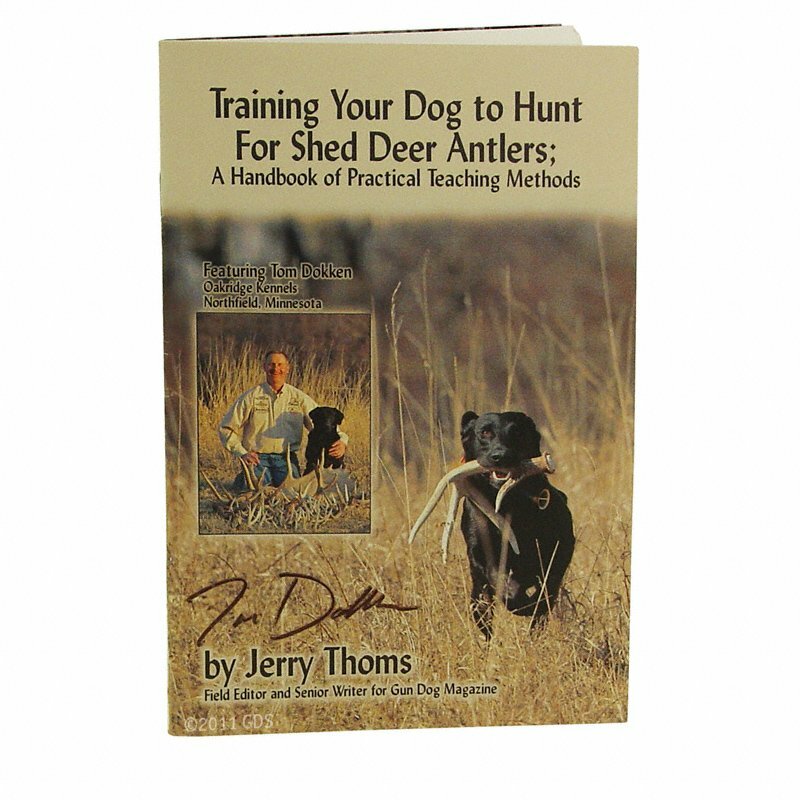 Training Your Dog to Hunt for Shed Deer Antlers by Jerry Thoms. $9.95. "Didn't really give me much more than I already knew about training a dog to retrieve." Didn't really give me much more than I already knew about training a dog to retrieve. Booklet features renown trainer Tom Dokken. Though many dog owners may not know this, most all breeds of canines from little Poodles to massive Great Danes can be taught to hunt for shed deer antlers. Hunting breeds usually are the easiest to teach because they are programmed by their genetics to look for, locate, and bring in game animals. Therefore, much of the information in this handbook will apply directly to gun dogs born and bred and trained as hunters. Having said that -- all dogs of all breeds have the genetic code in their background to naturally and instinctively search for just about anything that has an aroma. With a nose sensitivity a hundred times more intense than that of humans, all canines have the ability to hunt for shed antlers if given the necessary training. Using a dog to hunt for shed deer antlers is a rapidly growing sport in North America. Each year more people and their canines are searching the country for the antlers that buck deer (as well as elk and moose) drop every late winter and early spring. And, with deer populations ever increasing in every state of the USA and in every province of Canada, there are more of these shed antlers to be found every year. "Why Hunt Deer Sheds With Your Gun Dog?" Good source of exercise and physical conditioning all year for any dog and its owner. Good way to practice hunting methods for game birds by developing a dog's search, cooperation, retrieving, and other hunting skills. Good approach to helping deer hunters locate trophy deer because found sheds will reveal where big bucks hang out. These same deer hunters may help shed hunters to get permission for access to private property. Good chance to practice "bloodless hunting" for those who may not want to harvest live game animals. Good opportunity to have an outdoors experience for little cost because no license, expensive equipment, or time-consuming training are required. Good family activity because everyone can participate with no special skills required. So, as you can see, hunting shed deer antlers with your dog is a good thing that anyone can do anytime and nearly anywhere. If you have a dog and the desire to hunt shed deer antlers, this handbook of training instructions should help in successful hunting.